My lunchtime gaming group at work was getting tired of Call of Duty: Advanced Warfare around the same time that Overwatch by Blizzard was released and we decided to buy it and give it a go. At first I was put off by the unrealistic "cartoony" visual style but quickly overcame that due to the enjoyable mechanics and rock/paper/scissors dynamic at play in the matches. The maps are gorgeous albeit a little simplistic and the game runs very smooth and fluid. While everything runs smooth, the number of game modes is limited (4 although one is a combination of 2 others) and the number of maps are limited at 12, and to make matters worse, each map is only used for one game mode each (so three maps per game mode). However, alleviating this lack of diversity is the fact that 3 of the modes have an attacking side and a defending side which play very differently, and the fact that the large roster of characters have a wide range of playstyles. 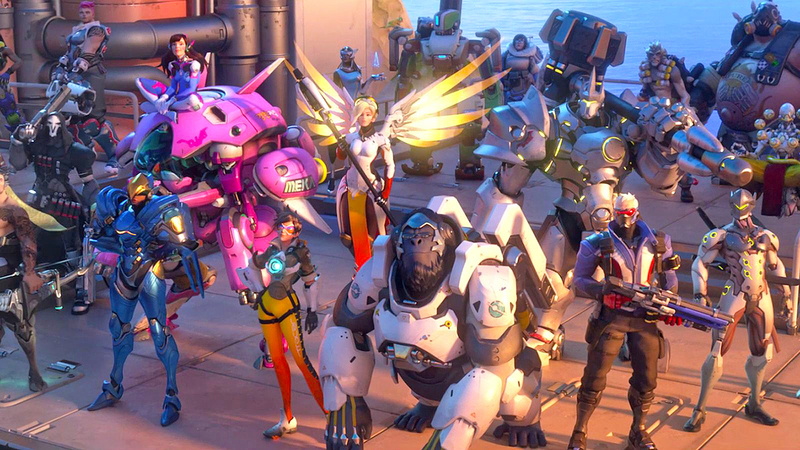 The main concept behind Overwatch is that of character abilities and which characters counter them, and how a team of 6 characters can synergize their skills better than the other side can. In the most simple terms, this means a team that picks and plays characters that compliment each other while countering what the other team has, and in more complex terms this means communicating via pre-canned messages and voice communications to coordinate attacks and counter-attacks. There are four types of characters: Attack which excel at dealing damage while very mobile, Defense which excel at more static defenses and damage dealing, Tanks which are made to absorb/block damage from hitting the rest of the team, and Support which primaryly means healing damage but also includes providing different kinds of boosts. The ideal team has characters from all the types in various combinations and that is where the lack of diversity of maps/missions is made up. You can try all the different characters in all the different game modes with different team make ups and have extremely different experiences, thus increasing the playability. Even if you choose to "main" with one or two characters, i.e. exclusively use a small set of characters in all missions and maps, there is still a lot of variety in what the rest of the team uses and what your opponents are using against you. Yes, some themes in character combinations become noticeable like the Reinhart tank with Mercy support on attack or the Torbjorne/Bastion defense pairing, but the balance is done well enough that other combinations are not rare for the same types of roles. And so far when a character is over-performing or is not being selected at all, Blizzard has not been afraid to balance abilities and stats in order to restore order. Overall I find myself really enjoying the game. I'm not the best FPS player but the match maker has been pretty good about putting together matches from players in queue that are reasonably equal. I look forward to the future new characters and maps and modes that they have planned.